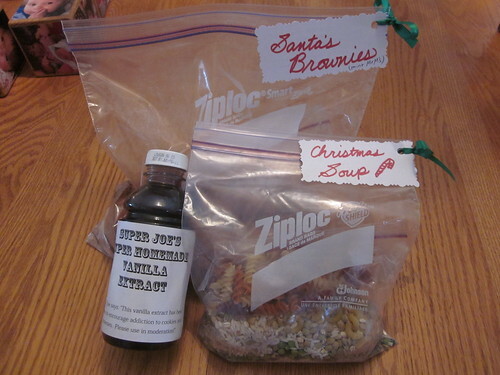 In our consumer driven world, its sometimes nice (and cheap) to get and give homemade gifts. Throughout the fall, I ran a series of posts on homemade gifts with enough lead time so that interested parties could make some of the gifts on their own if they so chose. I wanted to top off the series by listing all of the items in the series, showing off the small mountain of stuff we made, and providing some pictures of some of the ways in which we packaged items. That’s our collection of completed gifts. A few of them (some of the beer and a few of the jars) had already been given as gifts when we took this picture. As you can see, we made quite a bit of everything. The handmade greeting cards are the one thing that’s not very visible here – they’re in the white boxes near the back of the picture, with white ribbon (which I’ll show again below). 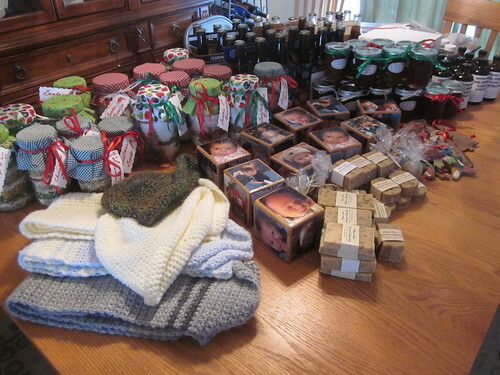 Here are some final gifts that we made at home. If you see something you like, remember to scroll back up to the posts above for more information on how to make the item! 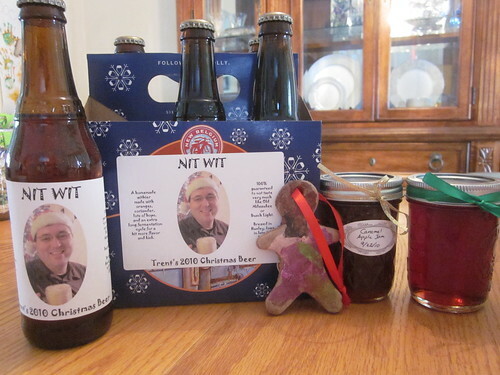 As you can see, we made custom labels for the beer, depicting me with a Santa hat drinking a pint. We entitled the beer “Nit Wit,” mostly as a self-deprecating joke but also because the type of beer we made is a witbier. Since we were reconstituting six pack boxes for this, we simply took extra Nit Wit labels and affixed them to the side of the carriers. Also, something worth noting with the homemade ornaments: we’re using a ribbon to attach them to some of the jam, jelly, soup, and brownie mix jars that we’re giving as gifts. We found some food-safe jars for the vanilla from an old friend who had extra jars from a food laboratory that were never going to get used. They hold eight ounces of liquid with screw tops. For them, we made up labels entitled “Super Joe’s Super Homemade Vanilla Extract” (referring to our oldest son’s superhero alter ego). A few of our gifts are traveling through the mail. For those, we’re packing up the soup in Ziploc bags so that they’ll ship easily. For the greeting cards, we wrapped each bundle (we made two bundles of 38 cards each) in tissue paper as you can see above, then sealed each bundle with a small snowflake sticker. We then put these bundles into small garment boxes, closed the boxes, and wrapped some red ribbon around them, creating an understated look. 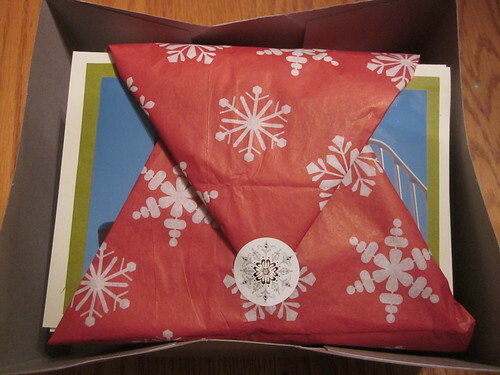 This was actually my favorite packaging of all of the gifts we made. 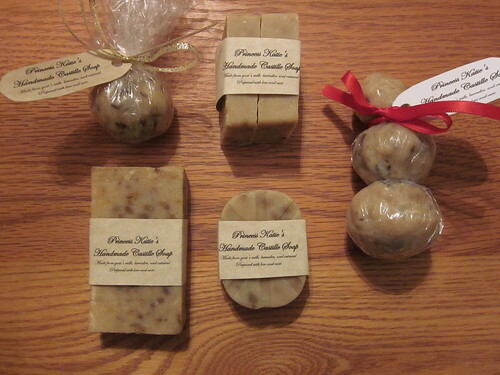 As we had a wide variety of soap sizes (including some “ball” soaps, which are something of a part of soapmaking tradition), we packaged them in different ways, as you can see above. Three soap balls make a cute little snowman! Around each soap bundle, we wrapped a small piece of paper entitled “Princess Katie’s Handmade Castille Soap” (after our daughter). We actually ended up with a lot of these, so there are many people who are getting two or even three bars of this soap as a gift. My wife, Sarah, deserves a lot of credit for helping all of these gifts reach completion. Some of the gifts were largely her project (like the scarves). Others were almost entirely my project (like the greeting cards). Others required both of our efforts (like the jams and jellies). In any case, these gifts were made as a team, and without working together, we would have never been able to complete so many gifts.